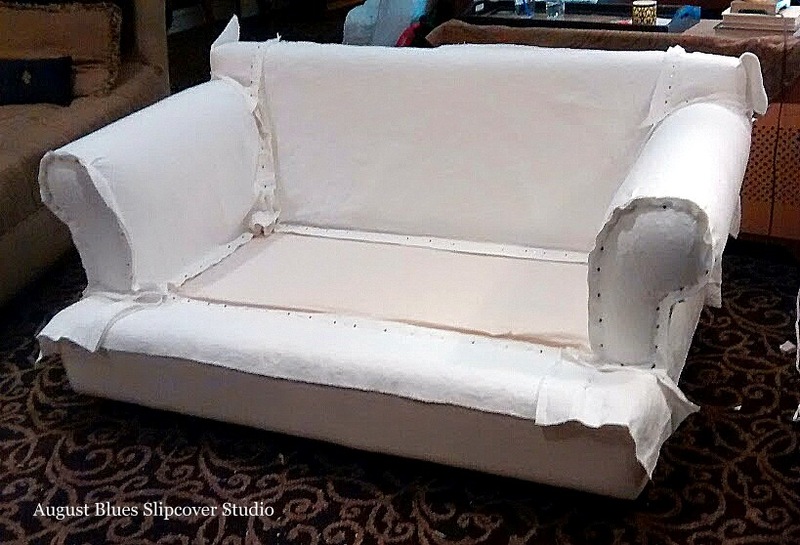 Sometimes it doesn't take a whole slipcover to make a big difference in a room. In this case, my client knew that she just wanted the backs of her dining chairs covered. The leather seats were in perfect condition and, of course, were perfectly suited for dining chairs, so we just needed to come up with a new look for the tapestry-style backs. She chose a brushed denim in Natural that was a great complement to the dark leather and wood of the chairs. We kept the look simple, with top-stitching along the "boxing" around the edges of the back. But, then, of course, we had to make the back interesting - it is the side of dining chairs that you see most. Covered buttons with loops, and top-stitching to finish it off. Now my client's dining room has a new look, without compromising the function (and isn't that a beautiful room?). You may have noticed that this chair has legs, not rockers. My client was able to remove the rockers and replace them with pretty legs. Now this chair can go anywhere an extra seat is needed! The gathered skirt was perfect for the curvy form of the chair. It was finished with a blind hem. Now the chair has grown up and is ready for it's new place in the guest room. Do you have a chair, or other furniture piece, you can repurpose?